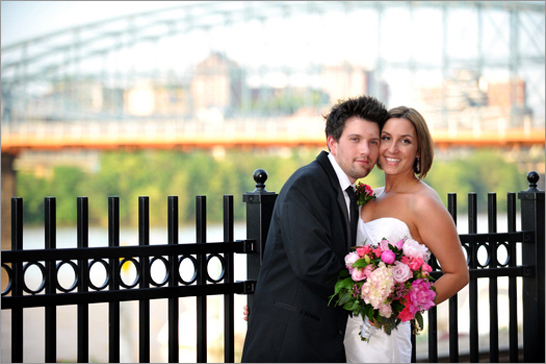 Dubbed “The Steel City” for its historic importance in the American steel industry, Pittsburgh offers an urban setting with numerous scenic locations for your wedding photography session. Begin your photo shoot at the charming Marriott Renaissance Hotel, located in the center of the city’s cultural district. Your wedding photographer can start off by using the hotel’s elegant front entrance as a backdrop for a portrait of the bridal party. Then venture inside and take pictures in the exquisite lobby, where the bride and groom can pose along the marble staircase or atop the balcony. The Bridge Bar can also serve as a great spot for a gentleman’s photo or a girl-only shot. Once you’ve finished at the hotel, have your limousine driver pick you up and drive you along the iconic Roberto Clemente Bridge, one of Pittsburgh’s Three Sister Bridges. The bridal party can stroll along the bridge’s sidewalk as your wedding photographer takes some snapshots. The golden steel structure and the glimmering Allegheny River will provide a stunning backdrop for a photo of the bridal party or for a private portrait of the bride and groom. Finally, drive over to Pittsburgh’s famous Penn Station, located only a few minutes away from the hotel. The bride and groom can pose beneath the beautiful brick arch at the station‘s entrance. Once inside, you’ll be greeted by a spectacular rotunda, where your wedding photographer can situate the bridal party for a portrait. The station’s waiting room is also a great spot to arrange the bridal party, as is the roof, which provides breathtaking view of the Pittsburgh skyline. Pittsburgh is also home to two of the nation’s premier higher learning institutions - Carnegie Mellon University and the University of Pittsburgh. Situated right beside each other, both campuses have countless picturesque locations for your wedding photography session. You can start your photo shoot at Carnegie Mellon’s College of Fine Arts, one of the campus’s original buildings. Your wedding photographer can assemble the bridal party with the building’s magnificent architecture as a backdrop, or set up a photograph of the bride and groom beneath one of structure’s marble arches. The university’s central lawn is also a beautiful setting for a group photo. The lawn’s walkway will lead you to the Hunt Library, another great location for your wedding photographer to work with. These are only a few of the gorgeous places you’ll find at Carnegie Mellon University. For your wedding photography session at the University of Pittsburgh, begin at the stunning Heinz Chapel, a historic landmark and a popular choice for wedding photography. The courtyard and lawn in the foreground of the Mervis Hall will work well for a portrait of the bridal party. 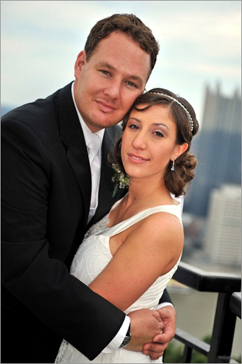 Your wedding photographer can also arrange of a photo in front of the William Pitt Union or the Cathedral of Learning, the latter of the two being the heart of the university campus. 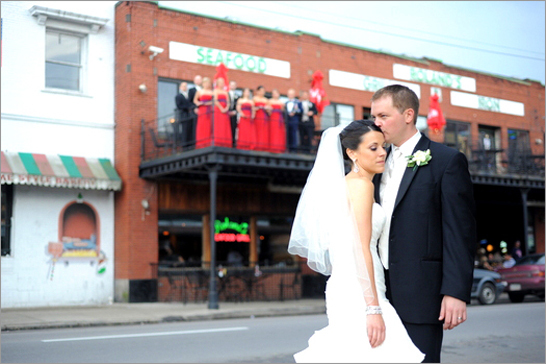 In close proximity of the campus you can find the Carnegie Complex, a charming backdrop for your wedding photos. And, if you have a chance, visit the Phipps Conservatory and Botanical Gardens. This Pittsburgh treasure is located only a few minutes from either campus and offers a plethora of gorgeous natural settings that will make for a wonderful conclusion to your wedding photography session. For a nature-filled wedding photography session, look no further than Highland Park - a favorite of Pittsburgh natives and tourists, alike. As you enter the park, your wedding photographer can have the bride and groom pose in front of the towering granite columns. Once inside, you and your bridal party can take a leisurely stroll through the park, exploring its vibrant flora while your wedding photographer takes some snapshots. After you’ve finished wandering along the park’s walkways, gather beside the central fountain and reflecting pool. Here, your wedding photographer can capture some light-hearted moments between the bridal party. It’s also a great place for portraits of just the groomsmen or of the bridesmaids, by themselves. Other great photography locations in Highland Park include Lake Carnegie, a tranquil little lake that can serve as a great backdrop for a group photo or a picture of the couple. The charming boathouse beside the lake will also make for a nice backdrop. Your wedding photographer can also pose the bride and groom on the deck protruding into the park’s glimmering reservoir. Finally, Mount Bigelow, located at the northwest corner of the reservoir, will provide plenty of lush greenery for your wedding photos, as well as a vantage point from which to observe the rest of park. You won’t regret visiting this Pittsburgh jewel for your wedding photography session!